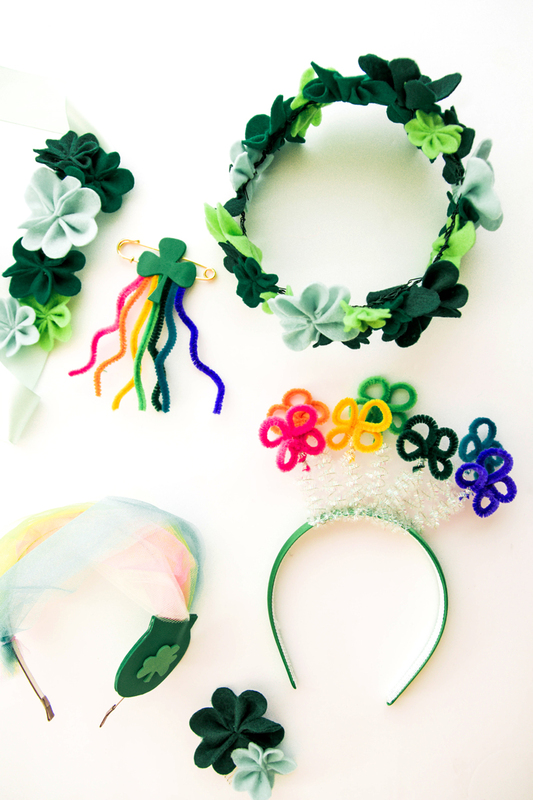 Inside: The cutest St. Patricks Day accessories! 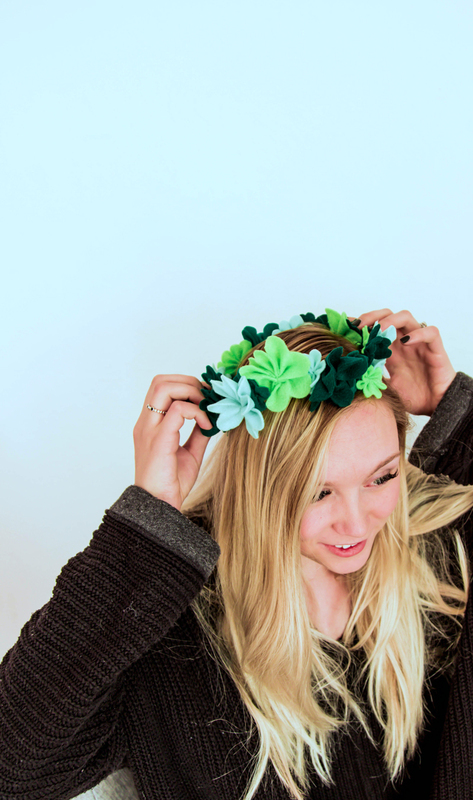 St. Patties Day is coming up and we’ve crafted up 6 St Patricks Day accessories just for the occasion. 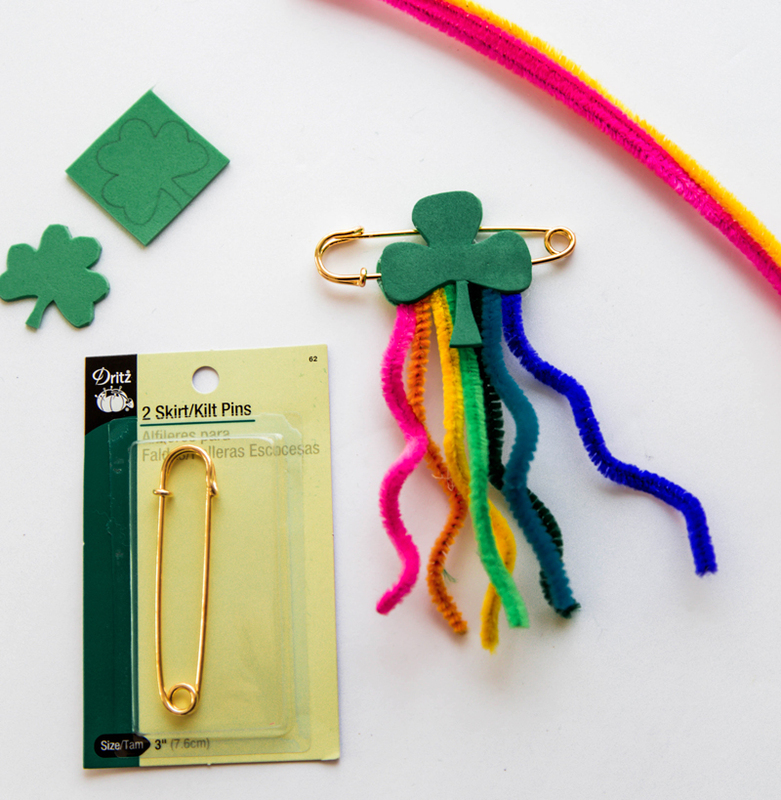 Each of these rainbow & shamrock clad pieces is easy to craft and a great way to ensure no pinching will happen to you! As much as I love wearing the color green, wearing it on an accessory is even more fun. 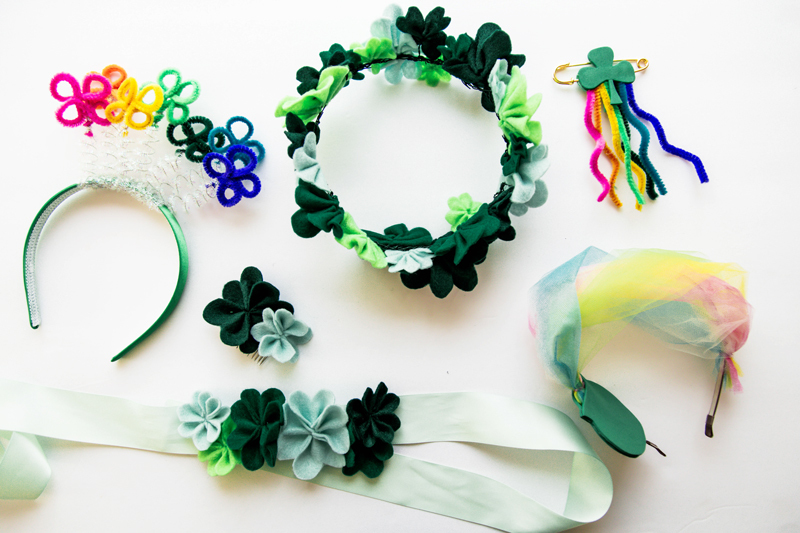 Here are a bunch of easy options you can make this coming week to adorn the entire family in leprechaun approved style. 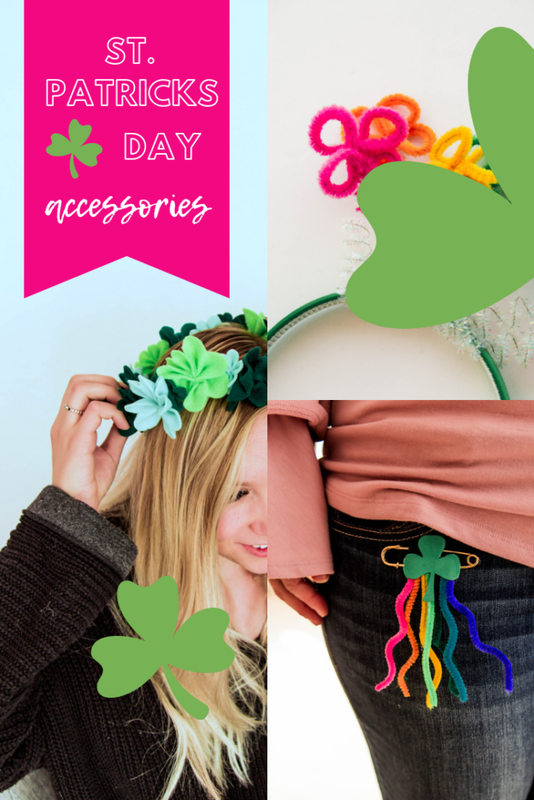 First up in our list of easy to create St Patricks Day accessories we have a Rainbow Flower Headband, which is great for slipping on and off as you run in and out of activities next week. 1. Grab a pipe cleaner. Place four fingers together and wrap the pipe cleaner around each finger, one at a time. Slide it off the tops of your fingers and twist the two ends together to hold the shamrock shape. 2. Twist the end of the shamrock with the end of a sparkly white pipe cleaner. 3. Using a straw wrap the white pipe cleaner around the straw creating a coil. 4. Wrap the other end of the white pipe cleaner around the headband. 5. Repeat for all the colors. 6. 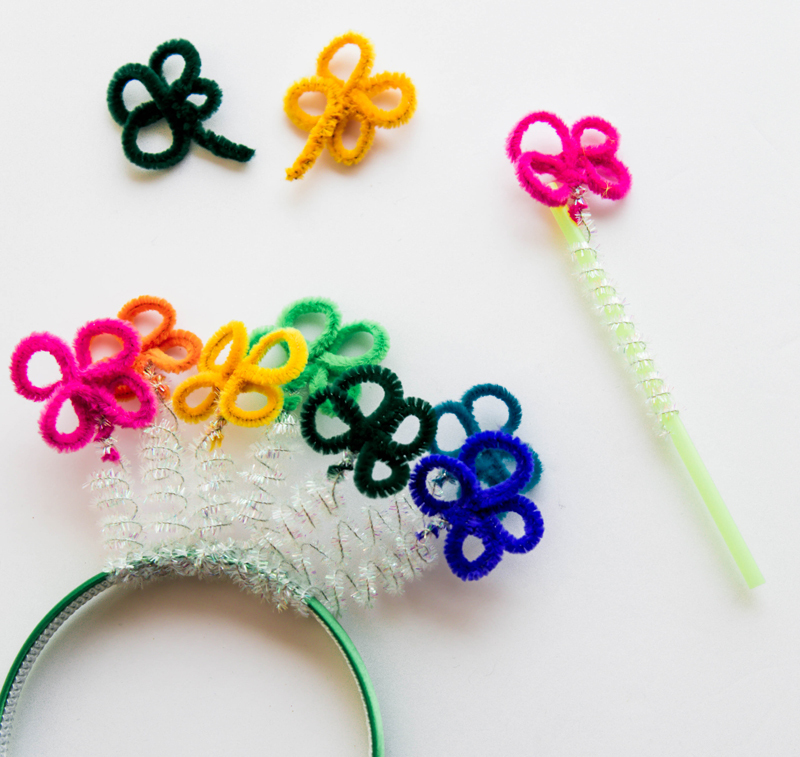 Use an additional white pipe cleaner to fill in any gaps around the headband. This one is by far my favorite! 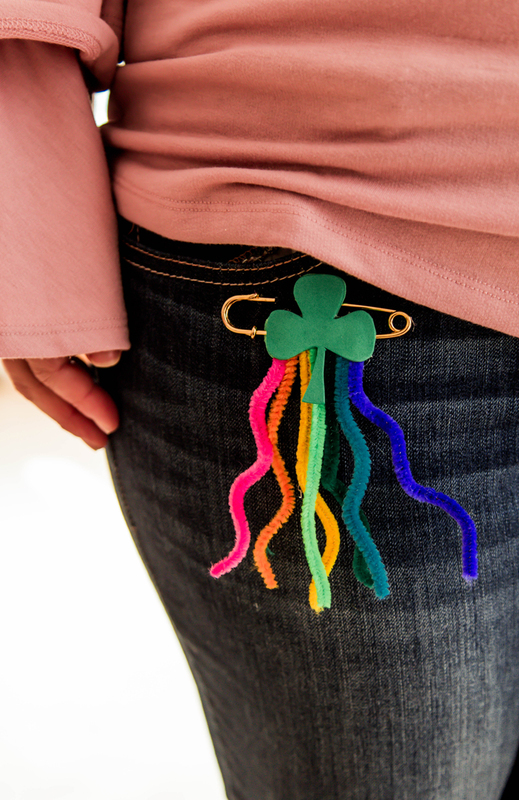 A simple shamrock rainbow pin that screams festive, but is small enough to not actually make you look like a leprechaun. Its one of the easiest ideas to wear with anything! You can find all the supplies for these crafts at Joann’s. Instructions: For the instructions on making this pin and much other fun St Patricks Day Accessories head on over to the Joanns blog. 1. Cut 4 squares of felt. Fold each square in half and cut a little scallop on the top of each piece. You’ll end up with two semi-circles at the top of each square. 2. Using a piece of floral wire “stitch” three small running stitches across the base of each piece of felt. 3. 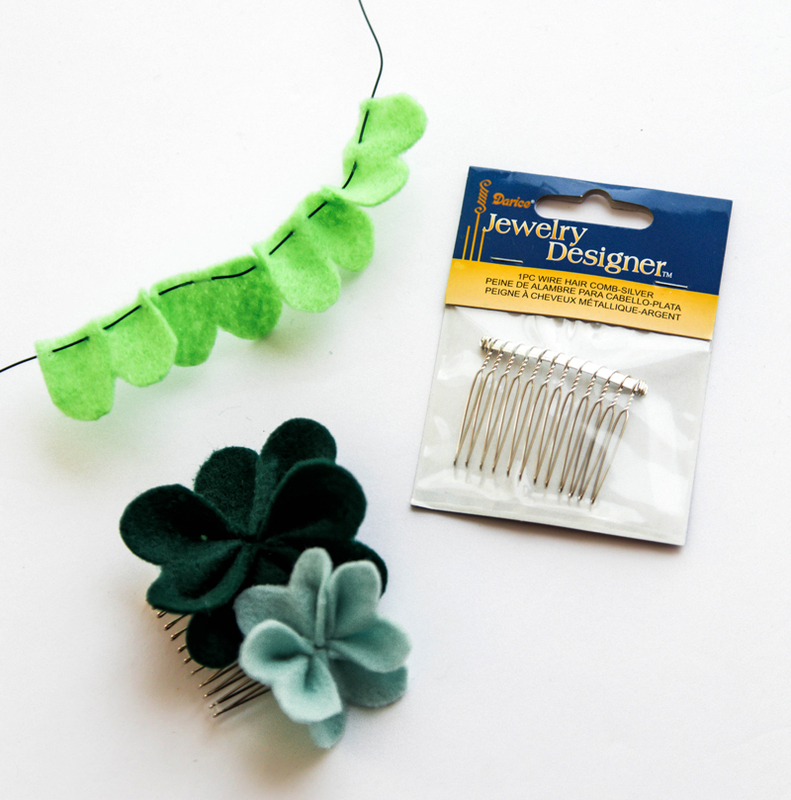 Gently push the felt pieces together to form a shamrock and twist the wire into a stem. 1. Wrap the floral wire around your head to the size you want. Wrap the wire twice more around to create a sturdy circle of wire, twisting the pieces and ends together. This is your base. 2. 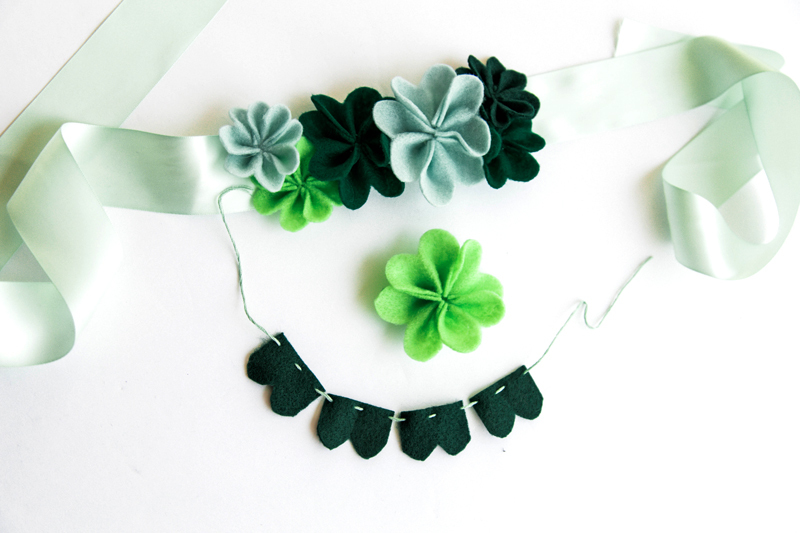 Make a bunch of felt shamrocks in varying sizes and colors. 3. Start attaching the shamrocks to the crown base by wrapping the “stems” around the base. We started with the bigger shamrocks and then filled in the spaces with the smaller shapes. You’ll notice a theme here that many of our St. Patricks Day accessories are rainbow and shamrock designed. Which is great because you can craft one and get the hang of it for all the other accessory ideas. 1. Create a handful of felt shamrocks in varying sizes and colors, using the instructions found above, or the ones over on Joanns blog. 2. Cut a long length of satin ribbon. 3. Find the middle and arrange the shamrocks in a cluster. 4. Hot glue shamrocks in place. A rainbow headband, to exclaim to everyone from the tippy top of your head – that yes you do believe in that sneaky leprechaun magic! 1. Cut each color of tulle 6-8”. 2. Cut 2 pot shapes out of the darker green foam sheet. We traced the shape on scrap paper, cut it out and then traced twice so we’d have two pots the same size. 3. Cut a shamrock out of the lighter green foam sheet. 4. 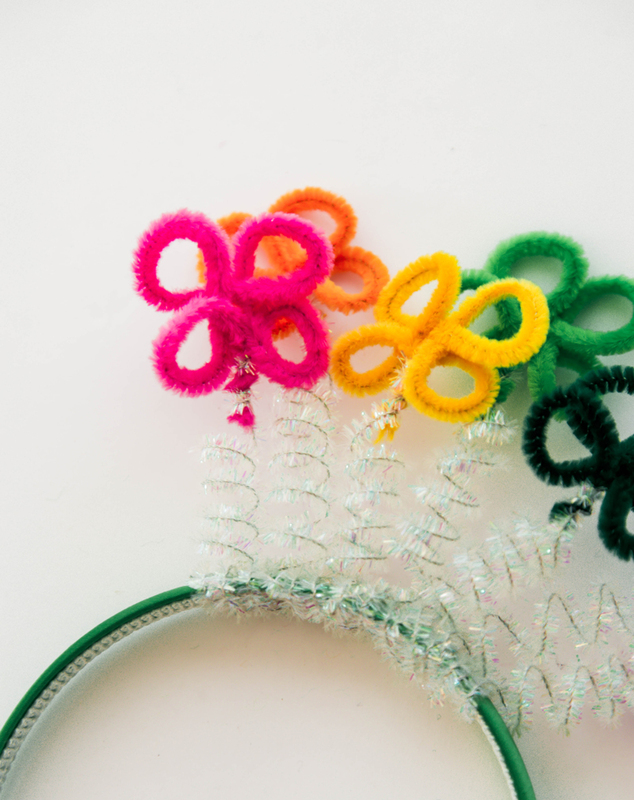 Stack the tulle pieces in rainbow color order and using a small clear elastic attach one end to your headband as if you’re tying a small ponytail. 5. Arrange the tulle and fasten the other ends with another clear elastic. We have all the layers one twist in the middle so all the colors can be seen. Make sure the tulle strips aren’t pull too tight. You want some volume! 6. Hot glue the shamrock to the front of one of the pots. 7. Sandwich the front of the pot and back of the pot onto the headband and hot glue in place. Make sure the one end of the rainbow is hidden within the pot. 2. Thread the needle with embroidery floss and stitch three small running stitches across the base of each piece of felt. 3. 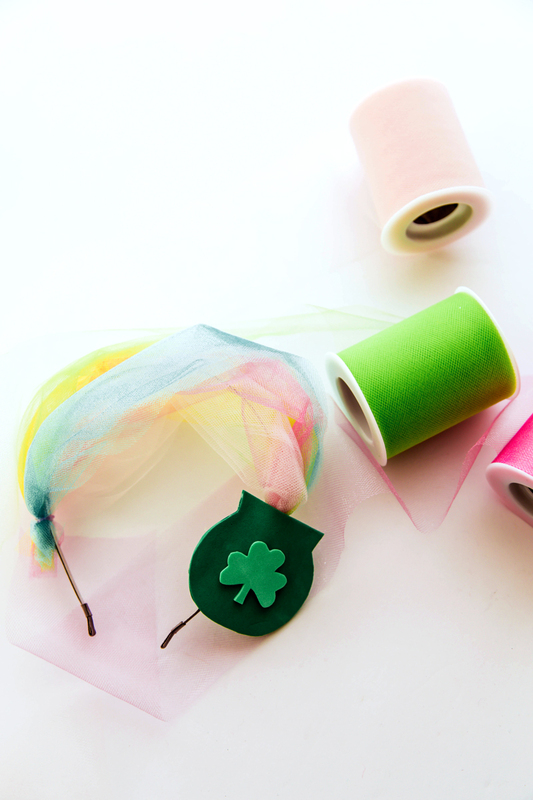 Gently pull the thread to gather the felt into a shamrock shape. Tie a double knot with the thread to hold the felt in place. Trim the thread ends. 1. Make a couple felt shamrocks in varying colors and sizes. 2. 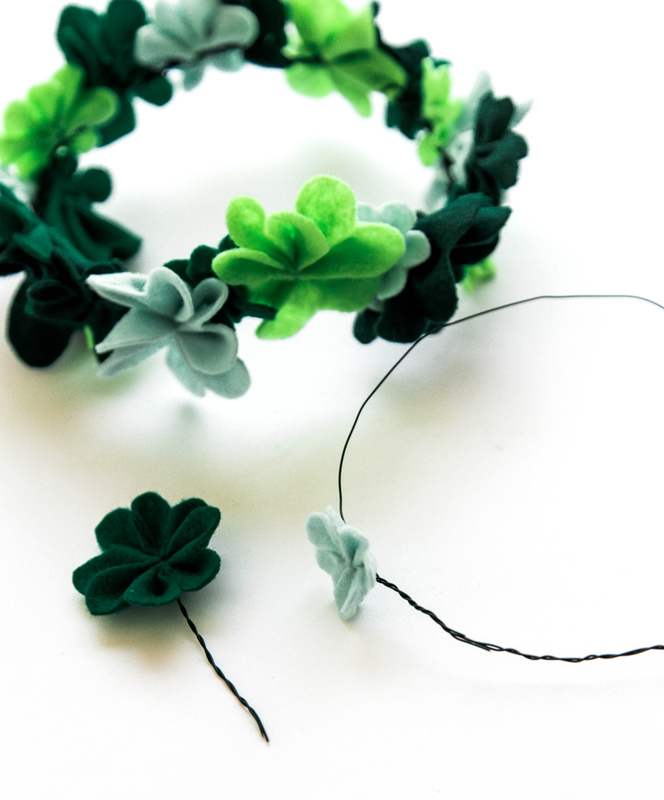 Hot glue the shamrocks onto a hair comb or other hairpiece. 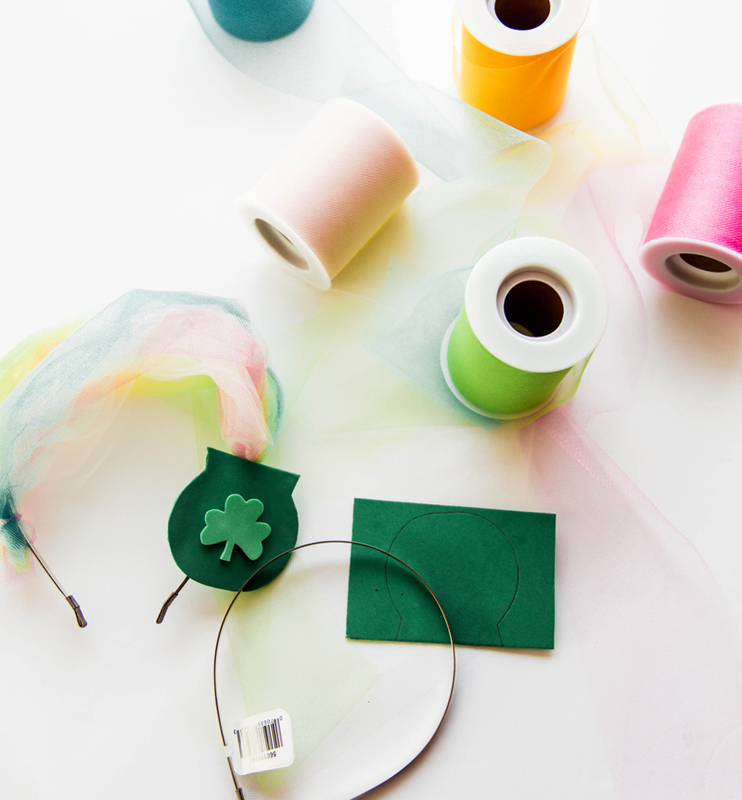 Whip up one of these easy St Patricks Day accessories and enjoy a leprechaun day filled with style and fun! PS. A few other crafty St Patricks Day Ideas Shamrock party balloons, Shamrock paper fans for carrying and a temporary shamrock tattoo. (This post is done in partnership with Joanns blog, a sponsor we adore and use daily).